PADIHAM, a small town, a township, a chapelry, and a sub-district, in Whalley parish and Burnley district, Lancashire. The town stands on the river Calder, 1½ mile N of the Leeds and Liverpool canal, 2½ N W of Rosegrove r. station, and 3 W N W of Burnley; and has a post-office under Burnley, a police station, water-works, gas-works, and a fair on 12 Aug. The township comprises 1,917 acres. Real property, £19,472; of which £3,914 are in mines, and £340 in quarries. Pop.in 1851, 4,509; in 1861, 5,911. Houses, 1,187. The increase of pop. arose from the extension of cotton spinning. The manor belongs to the Duke of Buccleuch. Huntroyde Hall, Symondstone Hall, and Gawthorpe Hall are chief residences. Coal is extensively worked; and stone is worked in two quarries. The cotton trade is largely carried on. The chapelry is less extensive than the township. Pop. in 1861, 5,452. The living is a p. curacy in the diocese of Manchester. Value, £220. * Patron, Le Gendre N. Starkie, Esq. The old church was an ancient edifice in mixed architecture; contained monuments of the Huntroyde and Gawthorpe families; and was taken down in 1866. The new church was built in 1867, at a cost of about £6,000; is in the style of the middle of the 15th century; comprises nave, aisles, N and S transepts, chancel with chapel in its S side, N vestry, S porch, and S W tower; and contains about 1,000 sittings. A cemetery is near the village, on the old Burnley road. There are chapels for Baptists, Wesleyans, and Primitive Methodists, an endowed national school with £27 a year, a British school, and a large Wesleyan school. The sub-district contains also seven other townships of Whalley. Acres, 11,963. Pop., 9,906. Houses, 1,945. Local studies information is held at Burnley library. Details about the census records, and indexes for Padiham. You can also perform a more selective search for churches in the Padiham area or see them printed on a map. The Register Office covering the Padiham area is Burnley and Pendle. Ask for a calculation of the distance from Padiham to another place. "PADIHAM, a township and chapelry in the parish of Whalley, higher division of the hundred of Blackburn, county Lancaster, 3 miles N.W. of Burnley, its post town, and 11-2 mile from the Rosgrove railway station, on the E. section of the Lancashire and Yorkshire line. The village, which is large, is situated on the banks of the river Calder, and on the road from Burnley to Clitheroe. A large portion of the inhabitants are engaged in the cotton mills. There are collieries and stone-quarries. The land is chiefly in pasture. The soil is of a heavy clay, with a subsoil of shale. The Leeds and Liverpool canal passes through the chapelry. The living is a perpetual curacy in the diocese of Manchester, value £131. The church, dedicated to St. Leonard, is an ancient structure, with a tower containing six bells. The chancel has a painted window. The church was enlarged in 1777, and again in 1822. The register dates from Queen Elizabeth's time. The parochial charities produce about £20 per annum. There are a British and two National schools for both sexes, the latter endowed with an annuity of £30. The Baptists, Wesleyans, and Primitive Methodists have each a place of worship, with Sunday-schools attached. The Duke of Buccleuch is lord of the manor. An annual fair is held on the 12th of August for pedlery, and cattle fairs in May and September." In 1835 Padiham was a township in the parish of Whalley. 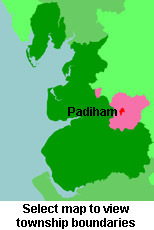 You can see the administrative areas in which Padiham has been placed at times in the past. Select one to see a link to a map of that particular area. View maps of Padiham and places within its boundaries. A map of Padiham around 1845. For probate purposes prior to 1858, Padiham was in the Archdeaconry of Chester, in the Diocese of Chester. The original Lancashire wills for the Archdeaconry of Chester are held at the Lancashire Record Office.